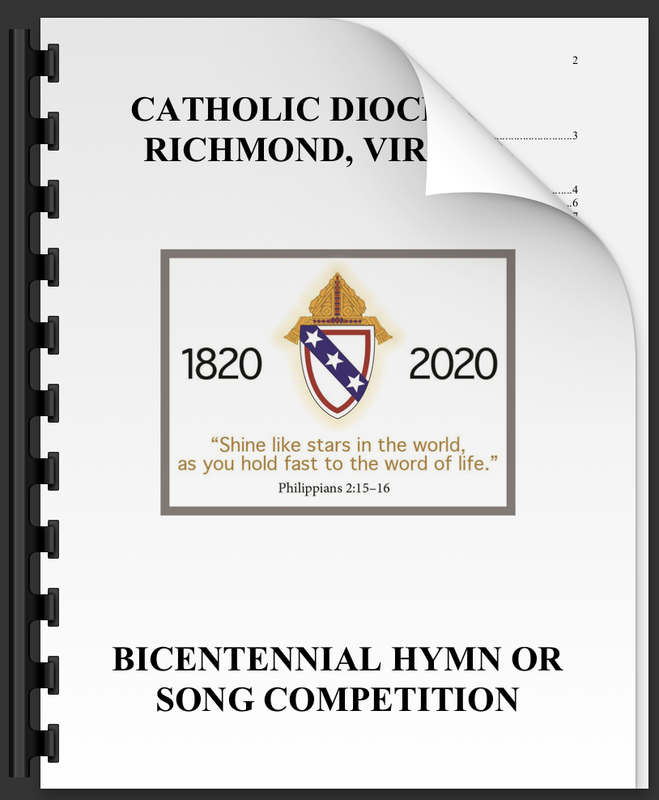 The Catholic Diocese of Richmond is sponsoring a competition for a liturgical hymn or song in commemoration of its bicentennial in 2020. This hymn or song will be used at liturgies (e.g., special Masses in parishes, the Eucharistic Congress, Chrism Mass, and possibly ordinations) throughout the bicentennial year. Parishes across the diocese will be encouraged to use the hymn or song during (and after) the Bicentennial year. The winning hymn or song should succinctly capture and express the bicentennial motto: “Shine like stars in the world, as you hold fast to the word of life” (Philippians 2:15–16), as reflected the history of the diocese. There is no requirement, however, to incorporate in the hymn or a song an explicit reference to any of the saints of particular importance to the diocese. An effective entry in this search will provide a singable, short-form hymn or song that could be used for the Entrance Procession or Recessional. Submission may be in the form of a through-composed hymn or a song with refrain and verses. Hymns or songs which include bilingual or multilingual aspects (e.g., Spanish) will be given serious consideration. The melody of the tune must be within the singing capabilities of an average parish assembly. The hymn or song should be a unison setting that can be sung by a cantor and assembly with keyboard accompaniment. Because the hymn or song will be used at diocesan liturgies with a range of instrumentation, instrument parts and choral harmony should also be included. Each composer or author and composer may submit up to three (3) entries. Each entry must be submitted electronically to Fr. Sean Prince, Director of the Office of Worship for the Catholic Diocese of Richmond at worship@richmonddiocese.org. Scores must be submitted as a PDF accompanied by a recording (live or digital). Digital scores (using programs such as Finale, Sibelius, MuseScore, etc.) are strongly encouraged and should be submitted as a PDF per #5 above; hand-noted manuscripts will not be accepted. To preserve anonymity, the name of the composer and author of the newly written text should appear only on the entry form and not on the copies submitted for judging. Entries must be received by May 31, 2019 in order to be considered. All entries will be acknowledged upon receipt. All entries must be previously unpublished and should not be simultaneously submitted for consideration in any other contest or for publication. All entries become the property of the Catholic Diocese of Richmond for the duration of the competition (until September 1, 2019). A cash prize of $1,000 will be presented to the winner. The author/composer of the winning entry may choose to (1) accept the prize money and assign the copyright to the Catholic Diocese of Richmond or (2) decline the prize money and retain the copyright. The winning entry will be published in the Catholic Virginian in the fall of 2019, and too, the entry will appear on the diocesan (www.richmonddiocese.org), bicentennial (web address forthcoming), and Office of Worship (www.cdrworship.org) websites. Thank you for visiting the Office of Worship's website. If your question(s) were not answered or addressed after searching our site, please contact us in the Office of Worship.